A England's latest collection is yet another masterpiece; this time it's a collection that's dedicated to the author of the worldwide famous English gothic novel Wuthering Heights, Emily Brontë. I fell in love with every single polish in this collection, and I'm eager to tell you why! I'm starting with Cathy, a beautiful, soft grey polish that leans a little lilac here and there. Cathy has a very fine & very subtle holo effect and blue shimmer. I think the soft color makes for a perfect nail art base that will combine perfect with all kinds of colors, but it works fantastic on its own as well. I can't wait to see this in sunlight, but at the same time, it doesn't need sunlight to look really lovely and sweet. I'm wearing 2 coats with top coat. Heathcliff is my least favorite of the bunch, but I'm loving it nevertheless! I can't point out precisely why, you know I'm not wearing blacks and glitters as much, but I don't know, this polish still has that elegant and sophisticated A England feel to it. Heathcliff is filled with blue, purple, red and silvery-golden glitters. Shown here is 2 coats of Heathcliff with top coat. Well hello there, you beauty! With Let Me In it's not just the color that does it for me, but it's pretty much a 1-coater, and you know what that means... stamping! Let Me In is a red-berry color, that can look more purple-berry as well, as some of my swatches show (on my screen at least :)). It's packed with that typical A England holographic sparkle that I adore. This is 2 coats with top coat, but 1 thicker coat will work as well. Woah! 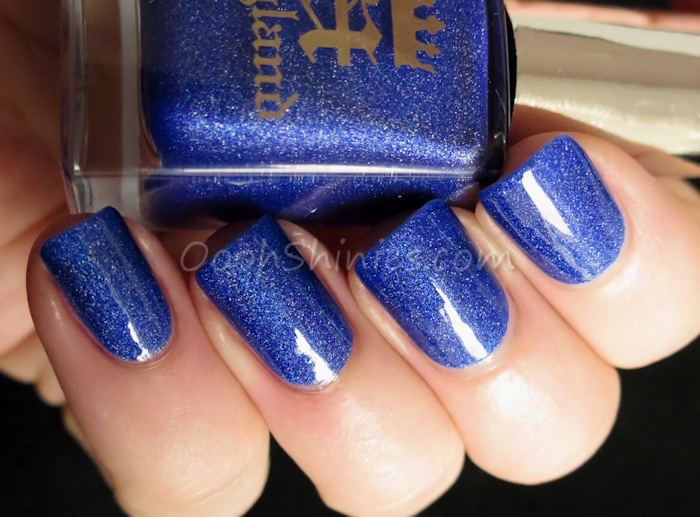 This has to be one of my favorite blues; the vibrant color, that holographic sparkle, and the flawless A England application, lovelovelove! My Spirit Of The Moors is unfortunately a little too sheer for stamping, but it still covers in 2 slightly thicker coats (swatched with top coat). Another finer and more subtle holo, this time in a medium grey base. It's perfect for these seasons, a classy polish that'll make for a great nail art base as well. Wuthering Heights covered in 2 coats (what's new!) and is shown here with top coat. The holo effect is more obvious than in Cathy, yet finer than the usual A England holo effect (as shown in Let Me In and Spirit Of The Moors). I'm looking forward to seeing this collection in sunlight! I couldn't skip this quote, it's shown with this collection on the A England website, isn't it romantic? You can find the collection in various webshops and of course on the A England website.